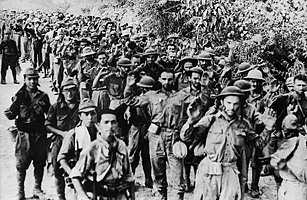 Forced by their Japanese captors to march 55 nightmarish miles through the thick Philippine jungle, only 54,000 of the 72,000 American and Filipino prisoners of war who participated in the Bataan death march reached their destination. Some of the survivors, known as 'ghost soldiers,' then lived in misery at the Cabanatuan prison camp. In January 1945, U.S. Army Rangers and Filipino guerrilla forces launched a mission to rescue the soldiers, going behind enemy lines to attack the camp. The 30-minute assault surprised Japanese forces and led to the liberation of hundreds of prisoners of war with few American causalities. Their heroic efforts were later recognized by then President Franklin D. Roosevelt, and the story has since been made into the film The Great Raid and chronicled in Hampton Sides' Ghost Soldiers: The Epic Account of World War II's Greatest Rescue Mission.